Real-estate companies are shamelessly converting public spaces into their own personal brands. The notion of privately owning and profiting from a public good is one inherent in capitalism, but the development of Durham represents a contemporary twist. Developers now aim to re-enclose the little commons we have left — including immaterial goods like our community and our history, in addition to their material bases — and sell them as a commodity. As corporations follow their wealthy workers back to urban centers, the notion of personally owning a city’s downtown, and all of the social goods that come with it, has been transformed from a marketing gimmick to an active goal of developers and other capitalists. Until about a decade ago, Durham was just another small American city with an economy left to stagnate after the departure of the industries that birthed it (tobacco and manufacturing). But, in a small-town version of the “Detroit vs. everybody” mentality, the people of Durham developed a pride in the “grittiness” of the city, seen most visibly in its architecture: large swaths of old factories, closed auto-body shops and gas stations dotting city blocks, old mill villages interspersed between it all. Thanks to cheap land and empty storefronts, galleries, bakeries, and restaurants popped up. Now Durham is a place praised by the New York Times , Travel + Leisure , and Southern Living for its commercial opportunities. Like other gentrifying areas, the investment came first to housing and retail. But, thanks to conspicuous Durham pride, investors claimed they wanted to be a part of what already existed. Projects like West Village — a massive complex of offices, lofts, and luxury apartments housed in old tobacco factories — were celebrated for their “creative reuse” of vacant, though historically significant, buildings. Yet these tangible parts of Durham’s past are only truly enjoyed by the wealthy. West Village is one of the most expensive housing options available downtown, and its businesses consist largely of stores that refer to themselves as boutiques, with the pricing to match. The same is true of similar developments, almost all of whose costs are prohibitive for the average person. Affluence, it seems, is a prerequisite for partaking fully in Durham’s history and culture. The process of gentrification didn’t stop with pricing out the poor, however. Now that the local economy has recovered and land values have risen, even the partial protection of Durham’s history that justified the initial investment has become impossible — only fiscally conservative construction projects with easily estimated costs can now be profitably built. Durham’s newest housing options (including a new addition in the West Village complex) no longer match the industrial and brick style; they are the kinds of condos you can find anywhere, not whatever Preservation Durham thought it was safeguarding. The privatization trend received the most criticism when the Liberty Warehouse, another historic tobacco landmark, was demolished to make room for still more luxury condos. The architectural sketches show an amalgamation of bright colors, steel beams, stucco, and glass, none of which can be said to match the style of the city’s cherished history. This despite developers’ claims that they have preserved something of importance by salvaging two sections of the original structure’s exterior walls, which will be “meshed” with the building. The destruction of Liberty Warehouse elicited such a backlash because of the violence done to Durham’s architecture and the wave of rising housing prices, which now threaten to price out the moderately wealthy residents who previously priced out the low-income residents. Development is promising an authentic connection to a community while it destroys that same community. The same logic of gentrification is ubiquitous: Chicago’s historically Hispanic Pilsen neighborhood now fighting to preserve its defining culture, Berlin’s graffiti-covered squats now being emptied and readied for development, the areas near Washington, DC’s Howard University now filled with new residents brought by businesses supposedly meant to aid the original residents. In each case, the culture of the area — loved because it’s unique, because it’s something that can be billed as authentic — is mined for new profits accessible via land ownership. Mainstream prescriptions to ameliorate gentrification miss this entirely. At most, policymakers ask that additional housing be built and set aside for low-income households. Yet development is now not only targeting public land, but the public itself, the very culture that ties a community together. Any response that simply requests additional units for the poor both fails in accomplishing its stated goal and ignores the danger of privatizing the community itself — a danger that often begins, but does not end, with housing. The crown jewel of Durham’s recent development is the American Tobacco Campus. Once the headquarters of the eponymous company, it was bought in 2004 by Capitol Broadcasting and transformed into a sprawling complex of offices, restaurants, and (yet more) luxury apartments. It’s the development project that most local advocates say spurred Durham’s economic turnaround. Though most can’t afford either an office or an apartment in the complex, American Tobacco does feature a large lawn that is open to the public and that hosts concerts and other community events. Across the street is the stadium for the Triple-A Durham Bulls (also the property of Capitol Broadcasting) and the Durham Performing Arts Center, a city-owned theater focusing on high-priced marquee events, and thus dependent on the wealthy patrons brought in by American Tobacco. In short, American Tobacco is a centerpiece of Durham’s community, praised by even the most ardent critics of Liberty Warehouse’s destruction. But despite the economic good it has done for Durham, the development has become the lynchpin in the argument for privatizing the public. And the damage this mode of development has wrought isn’t wholly symbolic. Because it’s privately owned, Capitol Broadcasting can police mass gatherings in ways impossible in truly public spaces. 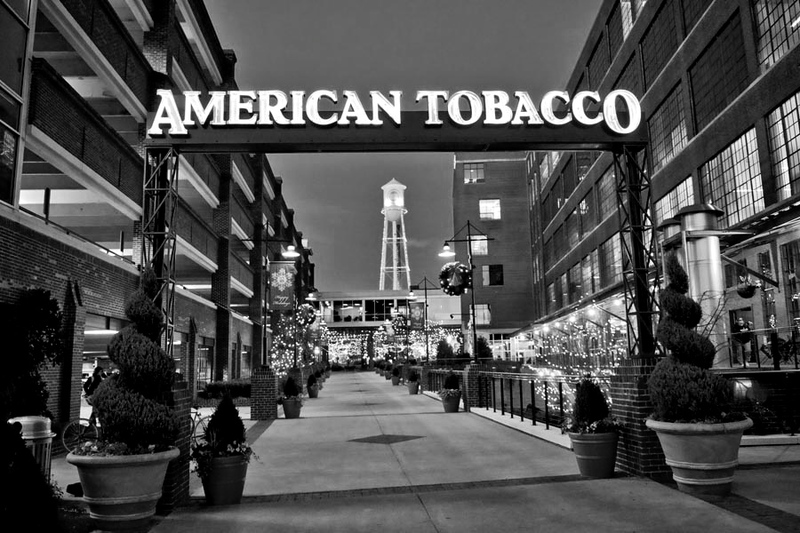 A note on American Tobacco’s website states: “The American Tobacco Campus is a business and entertainment center. As such, we do not allow activities not usually associated with the safe and orderly operations of workplaces and entertainment. Political protests and demonstrations of any kind are not appropriate to the campus environment and as such are not allowed.” Such commodification inhibits the vitality of that public life, narrowly channeling it into activities and viewpoints approved by private companies. Of course, that’s not how American Tobacco tells it. A video produced by an advertising firm representing the corporation and posted on WRAL, a local CBS affiliate owned by Capitol Broadcasting, frames the development project as Durham’s savior. The video is titled “Because No One Else Would,” implying that were it not for these noble business executives, Durham would have been left to rot. The goal, it seems, is to own the very existence of the community, to have the city answer to a private firm for its public value. “It’s about community development,” a Capitol Broadcasting employee says of their aims in the video. American Tobacco is hardly alone. There’s also the 21c, the new location of a boutique hotel chain that houses a “contemporary art museum,” and The Durham, another upscale hotel that will include a restaurant whose chef claims will be a “community living room” for the city. These businesses therefore hope to profit from the simple, foundational acts that constitute community. But by selling the idea of community back to the people that create it, they’ve also produced a kind of symbolic company scrip, turning Durham’s public into a privately owned brand. In Durham it’s to the point where Clarion Content, a progressive local news outlet, has celebrated the arts operations at Golden Belt, another privately owned factory/mixed-used space, seeing it as more equitable because it’s “consciously developed” in a poor section of the city and offers short leases. They did not mention that Golden Belt also consists of (even more) luxury lofts that start at $1,200 a month in a neighborhood with a median income of $16,000. Durham is just one example of the broader move to privatize public space. Another infamous case occurred in San Francisco last year, when a spat flared up between longtime working-class residents and affluent tech workers at a soccer field. Historically a site for pickup games among Latino residents, the city decided to rent the field for a fee, reservable by app. Even when cities are being planned, the importance of keeping the public, public is often lost. Emphasis is placed on “placemaking” as though the existence of certain goods within a city is enough. The Project for Public Spaces, for example, offers “eleven principles for creating great community places,” but none mention protecting public ownership. Once a city’s public areas are privatized, not only can the physical appearance of undesired people in those areas be denied (as at American Tobacco), but the culture itself can be sold as a commodity — all at the expense of the original community, both its physical spaces and the social activities that depend on them. The urban privatization game is similar to the business models used in the tech industry. Google, Facebook, and similar companies offer free services to attract a large user base. Those accounts are then used to attract additional users, at which point the companies can sell user data, essentially profiting from community-based interactions like sharing memories and wishing friends happy birthday. In cities firms have started marketing properties as though they are public areas, masking their private nature in an effort to attract more consumers. Then they point to the role their privatized public plays in the community, at which point they sell the very idea of community back to the public. To go to American Tobacco becomes an essential part of being a Durhamite, and the fact that Capitol Broadcasting owns and controls American Tobacco, and thus whatever part of Durham American Tobacco represents, is effaced. In essence, real-estate development has now entered into cultural capitalism not by branding its company, but by turning the city in which it owns land into its own personal brand. From here, the door is always left open for additional privatization, and the threat to community grows. Many claim that private ownership is necessary, especially in areas with faltering economies, in order to build thriving communities. But this argument obscures the role that public investment plays in ostensibly private redevelopment. Even Capitol Broadcasting admits in its self-aggrandizing video that it needed local government to rebuild American Tobacco. The question then, isn’t whether the state will be involved but for what end — to facilitate privatization, or to keep community spaces in the public sphere.